There’s a surprising number of men who still ask the same question that formalwear specialists still get at least once a day: what’s the difference between suits and tuxedos? Granted, to the untrained eye and from a distance these two things might look pretty similar. But it’s more subtle things that make up the difference between suits and tuxedos. By far the biggest difference between suits and tuxedos is the lapel. Tuxedos will have a satin lapel, giving them a ‘shinier’ look. Tuxedo jackets also have different buttons. Tuxedo buttons lack the four-holed look that suit buttons have, and are instead sewn tight to the jacket using a ‘stem.’ http://www.diffen.com/difference/Suit_vs_Tuxedo” says that suit jacket lapels are often made of the same material as the coat. Pants are another thing that make up the difference between suits and tuxedos. 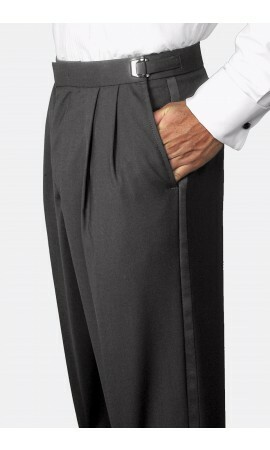 Tuxedo pants will usually have a satin stripe down the vertical side of the leg, whereas suit pants do not have the stripe. Likewise, shoes that are paired with a tuxedo are typically of a patent leather design, though there’s a current trend toward matte finish shoes with tuxedos. Suits, on the other hand, look funny with patent leather shoes, and a pair of nice, non-specific shoes compliment them well. Now that you know the key differences between tuxedos and suits. Another thing that sets them apart is when they’re typically worn. Suits are more casual than tuxedos. Wearing a suit to any of these would probably make someone look. For lack of better terms, underdressed and out of place. They recommend suits. For just about everything else: more casual weddings, semi-formal dinners, semi-formal work functions, etc. It’s not good to look overdressed, either.